Having built our little company up so that it was self-sufficient we had no idea as to what was going to happen on the night of the 14th February. We had built up a good reputation and secured business from companies like RIM (now renamed as BlackBerry), Vodafone and Attachmate. There wasn’t much in the way of frost, but it had been a very wet winter with a number of storms sweeping through the country and an almost daily basis, making the ground extremely sodden. As our financial year started in March we were finishing up the year and preparing with new targets for the new year. 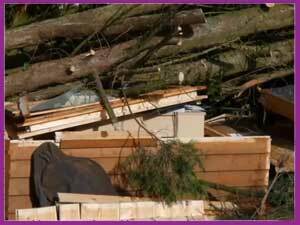 The storm on Friday 14th February was constant and the gust were quite severe. David had left for the day as the A34 is horrible at the best of times and my early evening work was curtailed when we had a power cut, which isn’t totally uncommon where we are. I retired for the evening and enjoyed the romantic setting of candles and fire whilst we listened to the radio. We made our way to bed at about 10pm, the electric was still off and the wind was howling, so the duvet appeared to be the favourite option. There is a period between being awake and being asleep which I call the ‘twilight period’, a state where you can hear what’s going on, but you’re unable to participate because you are almost asleep. It was then I heard a ‘whoomp’ and because I was in this ‘in between’ state I didn’t know whether that was something real or imagined, but as I opened my eyes my wife was already jumping out of bed to investigate.